Several weeks ago I asked myself, "Why do manufacturers call soymilk and almond milk 'milk' when they're not?" Milk comes from cows. So this is a misnomer—and apparently others agree. There's been ongoing debate in the dairy industry and on Capitol Hill on whether nut milks should be ascribed names that only true dairy products should have. In January 2017, Senator Tammy Baldwin (D-WI), introduced a bill called the DAIRY PRIDE Act to prohibit the use of terms used on dairy products to describe milk alternatives. The chief issue is that the FDA is violating its own "standards of identity" that define milk as the "lacteal secretion" from cows. Moreover, imitation dairy products lack most of the nutrients of authentic dairy foods (unless fortified), and plant-based beverages labeled as milk may be misleading consumers. In a Senate Appropriations Committee hearing in late April, Baldwin addressed FDA Commissioner Scott Gottlieb, MD, saying that she was "really concerned about the proliferation of mislabeled products in the marketplace that are using dairy's good name but have absolutely no dairy ingredients. These products are violating the [FDA's] existing regulations, and they're getting away with it because of the inaction by the agency." In response, Gottlieb agreed that companies use the term "milk" on products that aren't derived from lactating animals. He also said that if consumers are confused or being misled about nutritional content or product authenticity due to current labeling practices, this is something the FDA will evaluate. Gottlieb said he plans to issue a "request for information" from "people who can join the dialogue" so the agency can compile data for review. Baldwin said this isn't necessary, urging Gottlieb to simply enforce its regulations. Gottlieb pushed back, saying the agency's silence on these issues in recent years may make it challenging to now take action without new data. He assured Baldwin he has "actively stepped into this issue" and will take "a very close and fresh look at this." The dairy industry and others are divided. I agree with the senator that nut milks shouldn't be called milk. But there's no easy fix. Forcing companies to rename their products and change their labels would cause a food industrywide upheaval. Certainly, many consumers are confused about whether nut milk is truly milk and if it's equal nutritionally to dairy milk. But there are many still who aren't confused. Stay tuned for the next move the FDA makes. 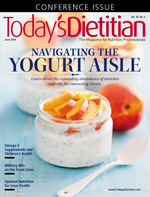 In this issue, Today's Dietitian features articles on yogurt, omega-3 supplements and children's health, and military RDs. Please enjoy the issue!